The helicopter shown below will give you an idea of the large Helicopter that crashed on Mt. Hood in May of 2002. The Air Force Thunderbirds form a hero's salute overhead. 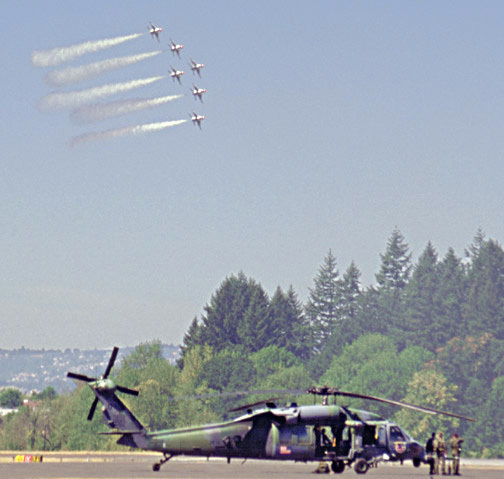 The helicopter shown is a Blackhawk transport helicopter (Sikorsky UH-60). "Mt. Hood kills a camper in 1980"
"Lahars" are often associated with eruptive activity, but they can also be generated by rapid erosion of loose rock during heavy rains or by sudden outbursts of glacial water. On Christmas Day 1980, an intense rainstorm rapidly melted snow and triggered a small landslide in fragmental debris in upper Polallie Creek (on the East side of Mt. Hood).... The resulting lahar moved downvalley at 25 to 35 miles per hour. At the mouth of Polallie Creek, the lahar spread out, killing a camper and temporarily damming the East Fork Hood River.... Flooding after failure of this temporary dam destroyed 5 miles of highway, three bridges, and a state parkat a cost of at least $13 million. Small lahars such as this occur every few years at Mount Hood, but few have been as destructive. View a much more recent such flood event in Oregon. This one occurring on Mt. Jefferson, Oregon's second highest peak in late 2006. Click here for more: Milk Creek event.